Wow. I am feeling so inspired. Not inspired to do anything personally, just inspired by listening to inspiring people. People who are at the top of their game and making a positive difference in other people’s lives. 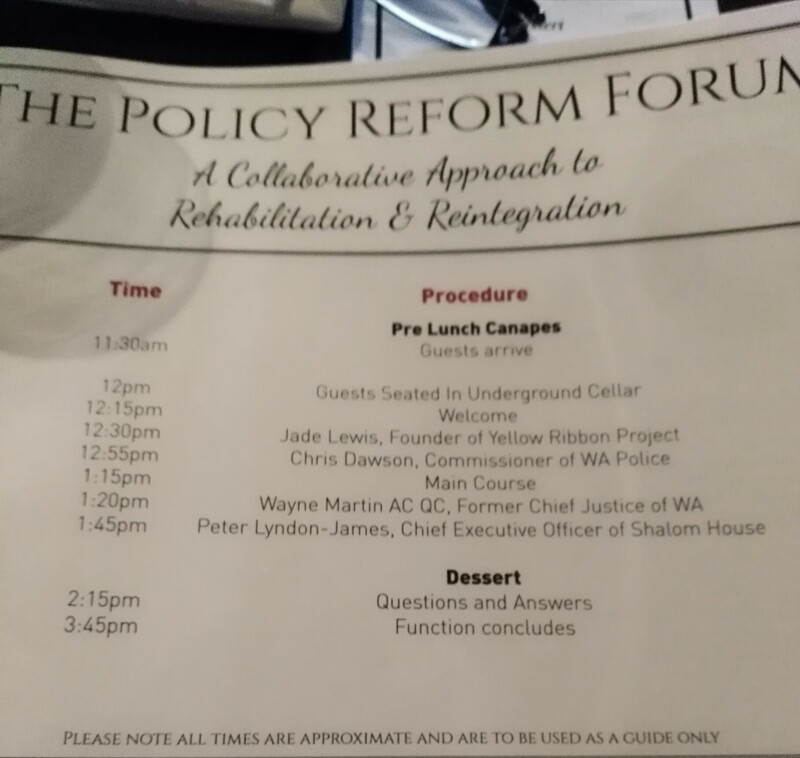 By chance I received an invitation to attend “The Policy Reform Forum – A collaborative approach to rehabilitation and reintegration’. It really isn’t the thing I would normally sacrifice my work hours for, and I had to pay for it, however the list of speakers was pretty impressive. I will list the four of them below with what I considered the key points each made (in my words). I forewarn any reader that it’s quite a long post, and I assume very few will bother reaching the end – but please read Wayne Martin point 2. I know Jade because Jade Lewis & Friends have their base in Bayswater (cnr Slade & Guildford). In fact, it was through a chance meeting with her husband, Tristan, that I was introduced to Jade and subsequently connected her with the relevant staff at the City of Bayswater when the group needed a new home. Subsequently they found a new, and welcoming landlord, in the City of Bayswater. Jade (and Tristan) are all about giving female prisoners, and former prisoners, a chance to turn their life around. She has written a couple of books which I recommend, and you can find out more by the links above. None of us ever really give much thought to a driver’s licence. We knew that when we turned 17 we would do some Mum or Dad lessons, then some professional lessons and then pay the fee to get the licence. What’s there to think about? However, there are people out there (often indigenous) who don’t have access to a car for the Mum/Dad lessons, or the funds to pay for professional lessons, or the money to pay for the licence. So they drive without a licence, and ultimately when they have been caught doing this enough times, they will be incarcerated. And then they are in the downwards spiral. All because of something so simple, and so basic, as a bloody driver’s licence! Incidentally, a similar story was given to me by the then head of Outcare (another City of Bayswater tenant), Sam Mesiti, and getting kids drivers licences is one of their worthwhile programs. Mr Dawson recognises the past injustices towards Aboriginals; it was the police who took kids away from their parents in the 1940’s and there are statistics that white kids are more often given a caution rather than prosecuted. As an aside, a year ago I caught a train with my two sons but couldn’t buy a ticket for some (valid) reason and as sometimes occurs, the ticket inspectors came along and I gave my case for not having one, and the guy moved on in an instant. It was then that an Aboriginal sitting opposite me said “you’re lucky; that wouldn’t have happened for me”. This left an impression on me, and probably will for my life. Anyway, Mr Dawson believes the stolen generation has led to an inter-generational standard response of any police vehicle turning up at an aboriginal household of them running away. He takes great hope in changes occurring where the police and indigenous are getting along and when now a police car turns up, the kids run to the car. I share his hope, and see his point. He’s against decriminilsation of drugs; the libertarian in me is not sure on that. Well, probably the smartest guy in the room, but he initially raised my hackles with some “leftie” ideology, however I am not a bigot, so tuned in to his presentation to see if I needed to change my mind. And I did (points 2 & 4). The prisons are full. This takes the focus away from any meaningful method of changing the people within, to where do we put, and how do we manage, them all. Parole – It is currently seen by the public as a discount on a sentence rather than an opportunity for rehabilitation. I now believe this is a mistake. Would you prefer the criminal to complete his full sentence, be given his belongings and then released back into society with no conditions? Or would you prefer the criminal to be released a few years early straight into the arms of a probation officer who informs them of conditions such as blood/urine testing to check they are not on drugs, and obligations of job seeking etc. In other words, parole allows for the active supervision of criminals whereas if someone serves their full term, there is none. As was also pointed out, the perverse irony is that the very people who need to be monitored (high recidivism likelihood) are the ones who aren’t paroled, however the ones who don’t (e.g. committed a one off crime and are otherwise are socially adept) get paroled. In summary, Mr Martin believes more people on parole makes the community safer. Circuit court – I don’t know much about this, but apparently it is where a Magistrate sits with Aboriginal Elders during sentencing. It used to occur in WA but has drastically reduced, whereas it is increasing in other States. It is of use because it includes the shaming of the criminal by the Elders rather than simply the ‘white man’s court’ which isn’t respected and is almost a rite of passage. Apparently shaming is a bigger thing to be avoided rather than jail. Mandatory sentencing – This was pretty much disliked by all presenters, but especially Mr Martin. People who are sent to jail, and the sentences, are not in the best interests of the community. I have now changed my mind on this. Shalom is a Hebrew word meaning peace, harmony, wholeness, completeness, prosperity, welfare and tranquility. If you don’t know about him, the links above will tell you. Essentially, he helps released male prisoners and/or addicts restore their lives, and thereby, their families. An issue apparently is that “you can take the prisoner out of prison; but then you’ve got to take the prison out of them”. He helps do that. I’m one of those people who tear up during certain movies, and when Peter got emotional on recounting his history, I teared up with him. As did others. His story isn’t for me to tell; neither would I do it justice. This WAToday article will give you the gist. At Shalom House there is a choice; you don’t have to be there. If you want to go back to your old lifestyle, you are close enough to do that. This is why Shalom House needs to be where it is in the Swan Valley – close to temptation yet a safe distance from it. If they were located in the middle of nowhere, then there is no choice; the participants are safe but on their return to ‘normal society’ they are not prepared for the lure of their old lifestyle. Shalom House needs to be where it is, so it was disappointing that just last night (Wed 26th) the City of Swan refused their application to be considered a ‘community purpose’. In essence, the City of Swan re-affirmed their previous position from 4th July 2018 to refuse Shalom House from operating in the Swan Valley. The City of Swan Officer’s recommended approval, but the council vote was 8-5 against. Despite the Officer’s report being well written, the actual City is poor on their accessibility, so you need to go and search for item 3.9 here to read the report and in particular the State Administrative Tribunal (SAT) attachment in the last pages of the report. I almost feel bad for giving SAT a serve at our last council meeting on Tuesday when I now see they are the last chance Shalom House have for remaining in the Swan Valley. Perhaps they actually have a positive purpose. Thank God there are people like the above out there. No one sugar coated the fact that about 40% of incarcerated men are Aboriginal. A little over 50% of all incarcerated females are Aboriginal. And tragically about 70% of incarcerated children are Aboriginal. But all were sympathetic to the causes of this. Jailing people (at great cost to tax-payers) for the non-payment of fines is simply stupid. 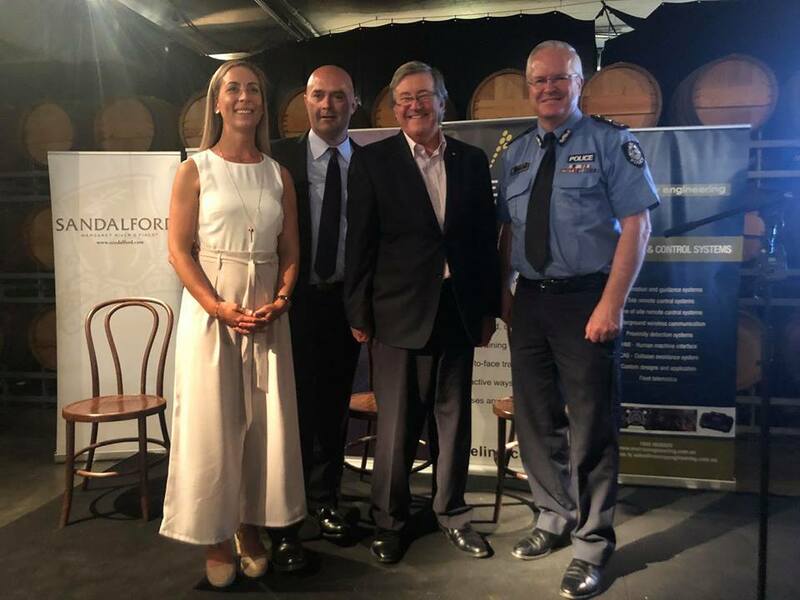 The sponsors of the event – Sandalford Wines, Access Group Australia, Aveling, Decmil, Design Sense, Ernst & Young, Murray Engineering & Sansom Capital. Corporate dollars are hard to come by; they all must have directors who believe in, and support, the changes which these people are making. Power to the People … and thanks if you made it this far. It all makes sense. Wonderful inspiration. Great coverage of the event and speakers points. I think that you grasped the essence and message of the event perfectly. I believe that even writing this blog piece and showing your change of mind towards certain aspects of sentencing and rehabilitation is going to have an amazing effect on readers. Making changes to the culture and peoples understanding surrounding the justice system will help to make bigger changes in the future. (Drink driving, wearing seatbelts etc.) You’re playing your part and using your influence in a really positive way. Glad I voted for you. Hi James, that’s really nice of you to say so. Thank you. Excellent summary Chris, look forward to catching up soon.